Lawns are lush and green, but they take a lot of water, fertilizing and maintenance to stay that way. If you live in a drought-prone area or just want to relax a bit more on the weekends instead of fussing over your lawn with weeding, feeding, trimming and mowing, consider taking out the lawn. Replace it with low-maintenance rock mulch. Cover the grass with black plastic weighed down with rocks. Garbage bags will do. Keep the plastic on the grass for at least two weeks. 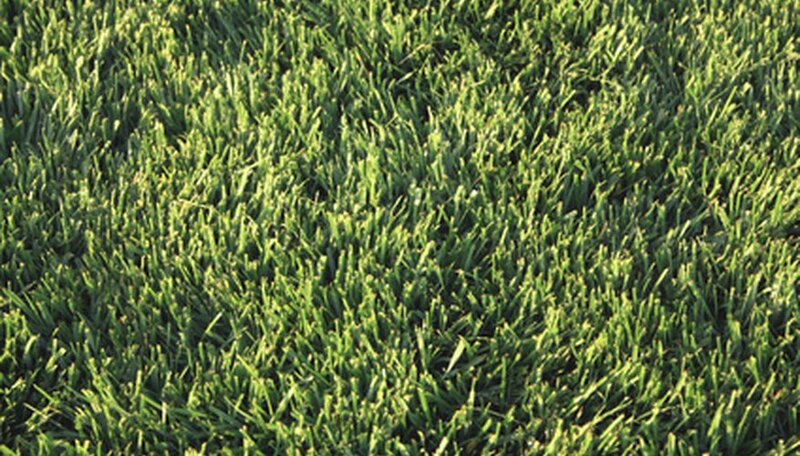 The lack of sunlight and moisture, combined with the heat trapped by the plastic, kills the grass, making it easier to remove and less prone to grow back. Slice off the top of the grass, including 1 or 2 inches of roots, with a flat-nosed shovel. Stick the shovel directly into the ground vertically every 2 feet as if you were cutting a cake. The cuts only have to be 2 inches deep. Slice the grass off between the cuts. If the ground is too hard from lack of water, water until the top 1 inch of the soil is wet. Then, dig again the next day. Save the dead grass for the compost pile. Don't use it directly as mulch on the garden as it may contain seeds that will re-sprout. The heat generated from the compost pile will eventually kill the seeds. Rake the soil smooth and remove any roots or large rocks. Cut landscaping fabric to fit the area to be filled with rocks. Lay it out on the surface. Landscaping fabric keeps weeds from popping up while letting rain and moisture through. This is valuable if you will be placing plants among the rocks. Edge the area with plastic vinyl edging, bricks, pavers or wood. The edging keeps the rocks in place. Lay the bricks or pavers directly on top of the landscaping fabric. Follow package directions for the vinyl edging. The wood may either be pounded into the ground if they're posts or laid on top of the fabric if they're planks. Fill in the area with rocks by dumping them in by the bucketful. If the area is large, use a wheelbarrow to transport the rocks. Remove the edging in a narrow space so the wheelbarrow can fit through. Rake the rocks evenly over the area. Removing a lawn can be hard work. Do it over a period of a few days. Do not use plastic underneath the rocks as it eventually will deteriorate and start showing through. At that point it's difficult to remove.